The battle between the two teams began as expected, with both sides playing a high-pressure game from the first blow of the whistle. Nepal and Bhutan were evenly matched through most of the match with both sides getting their fair share of chances. 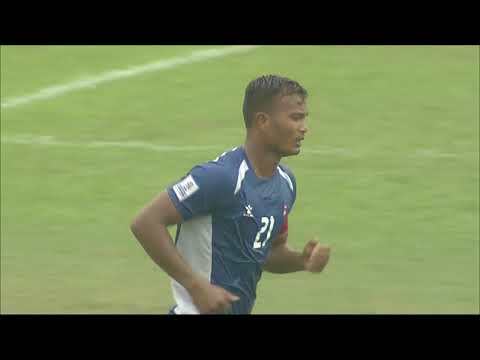 It was Ananta Tamag who rose the highest in the 21st minute, following a well delivered corner from Sunit Bal to get Nepal ahead in the game. Bhutan's woes were made worse after Nima Wangdi's second yellow resulted in a one-man deficit along with a penalty being awarded to Nepal in the 70th minute. Bimal Magar stepped up and his effort was saved well by Ngawang Jamphel, but Sunil Bal made no mistake and struck the back of the net from the rebound. With a one-man advantage, Nepal looked unstoppable and substitutes Bharat Khawas and Niranjan Khadka added to the team's tally before the final whistle was blown. Bhutan were occasionally impressive in moving the ball between tight spaces, but couldn't keep the ball long enough to trouble the Nepalese defense. Speaking after the match, Bhutan head coach Trevor Morgan said, "We conceded three goals from set pieces. I watched Nepal play before the match. They got in-swinging corners and good movement. We spoke about it and yet it happens in the game and that's what frustrating." Nepal Head Coach Balgopal Maharjan spoke about the improvements from the last game, particularly in the attacking third and set pieces. "After taking over the national team, I particularly focused and worked on the set pieces. We prepared and structured the players to get the best out of the set pieces and that's how we won," said Maharjan. Nepal will now face hosts Bangladesh to fight for a spot in the semi-finals. With a deficit of six goals, it'll be a mountainous task for Bhutan to salvage enough goals and points and have other results go their way, to progress.